It is quite easy to disable or/and enable the Taskbar auto hide feature in Windows 7 or Windows-8! Please Click the right mouse button on an empty area in the Task Bar! Via Taskbar context-menu open the Taskbar Properties! Click "Properties" [... see Image 1 Arrow-1] in context-menu. In the Task-bar Properties, please disable or enable "Auto-hide the taskbar" [... see Image 1 Arrow-2] . Disable or enable the Task-Bar auto hide feature in Windows 7! 5. Totray: Customize which icons and notifications appear in the notification area. 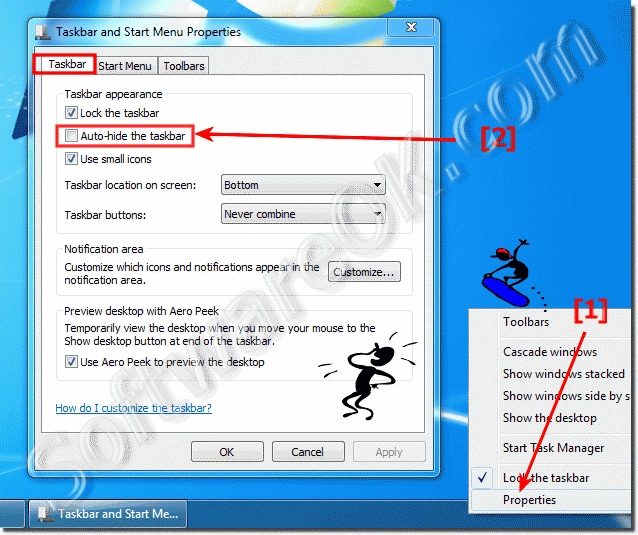 Windows-7 - FAQ-64: How to disable or enable the Taskbar auto hide feature in Windows 7?